Original commemorative plaque. 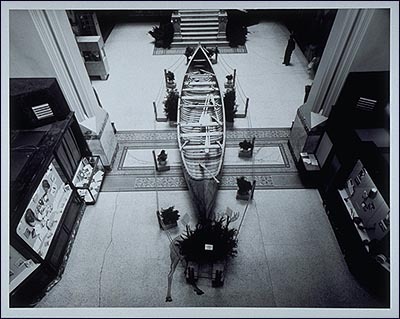 The canoe was first displayed in the National Museum of Man (above), precursor to the Canadian Museum of Civilization at its McLeod Street location in Ottawa. his is a full-scale replica of a canôt de maître or a Montreal Canoe which the early fur-traders used. Made by Chief Matt Bernard and his kin in 1957 on the Algonkian Indian Reserve at Golden Lake Ontario. It was mainly through the foresight, effort and financial generosity of Mr. D.A. Gillies of Braeside, Ontario that this canoe was built. With some recent additions, the Museum portrays this vessel as similar to that which carried the Hudson's Bay Company Governor Sir George Simpson and his English bride, Frances. A freighter, the eleven-metre Algonquin-style birchbark canoe in regular use would transport more than three tons of goods and people as far as eighty kilometres each day. When the Simpsons travelled from Lachine (Quebec) to Red River (Manitoba) in 1830, they rode upwards of two thousand kilometres along the Ottawa River and across the Great Lakes in a canoe. The governor's taking up residence in Western Canada and the arrival of a European woman of high rank signaled major changes in Canada's fur trade economy and society. 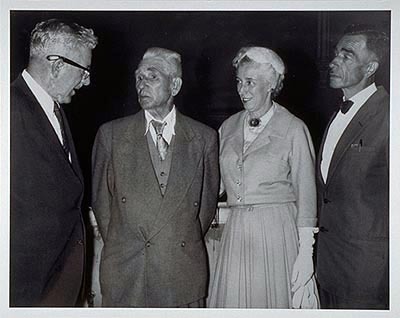 fficial Opening of the National Museum of Man's Montreal Canoe exhibit in 1958. The vessel remained on display for thirty years. From left to right: Dr. J. Rousseau, museum director, Chief Matt Bernard, canoe builder, Hon. Ellen Fairclough, cabinet minister, and Mike Bernard, canoe builder.